I have to confess a certain affection for Finnish "love metal" balladeers HIM, after seeing their show at Club Zoo in late 2005, right as they were breaking in the U.S. I was there writing about the venue, not the band, for City Paper's Best of Pittsburgh issue, which meant interviewing young teens and feeling kinda old and creepy, though the band was both much older (through no fault of its own) and creepier (on purpose). 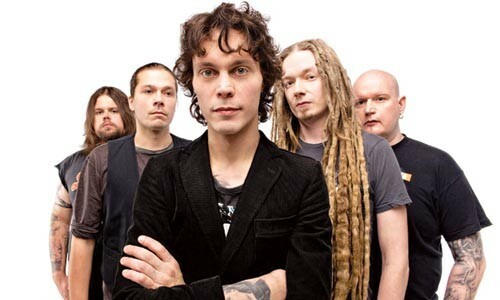 From first note to last, HIM frontman Ville Valo had the young audience by its heartstrings. Or rather by its heartagrams: HIM's trademarked symbol combines a pentagram with a Valentine's heart. HIM (originally "His Infernal Majesty") formed back in 1995 in Finland, and by the time it reached our shores 10 years later, with Dark Light and the single "Rip Out the Wings of a Butterfly," the group had already developed a sizable discography, a look, a live show and a whole marketing scheme around its heartagram logo. It's a story and sound similar to fellow countrymen and occasional collaborators The 69 Eyes, complete with occasional lost-in-translation lyrics. The group is back at Club Zoo on Mon., April 5, with a brand-new album, Screamworks: Love in Theory and Practice. In some ways, this could really be the moment for HIM, if the band is able to connect with Twilight fans like it did earlier with Hot Topic mall-goths. It's not that much of a stretch -- Valo's moody looks could pass for Robert Pattinson's rock 'n' roll older brother -- and if the new video for the surprisingly sunny "Scared to Death" is any indication, HIM is out to conquer a larger segment of the mainstream. Parents, lock up your vampires.